When a military drone on a reconnaissance mission is seized behind enemy lines, a group of engineers work immediately to remotely delete sensitive information from the drone’s chips. The fact that the chips are optical, not electronic, enables the engineers to simply flash a UV light beam onto the chip to immediately delete the entire content, thus preventing a disaster. Such a James Bond-style chip is very close to reality now, thanks to the innovative development made on a nanomaterial created by Yuebing Zheng, a professor of mechanical engineering and materials science and engineering in the Cockrell School of Engineering. The outcomes of the research were reported by his team on 10 November in the Nano Letters journal. The molecules in this material are very sensitive to light, so we can use a UV light or specific light wavelengths to erase or create optical components. Potentially, we could incorporate this LED into the chip and erase its contents wirelessly. We could even time it to disappear after a certain period of time. In order to investigate the innovation, the researchers employed a green laser to form a waveguide on their nanomaterial. A waveguide is a tunnel or any structure guiding light waves from one point to another, and is an important photonic component and a building block of integrated circuits. Then, they used UV light to erase the waveguide and, by means of the green laser, re-wrote the waveguide on the same material. 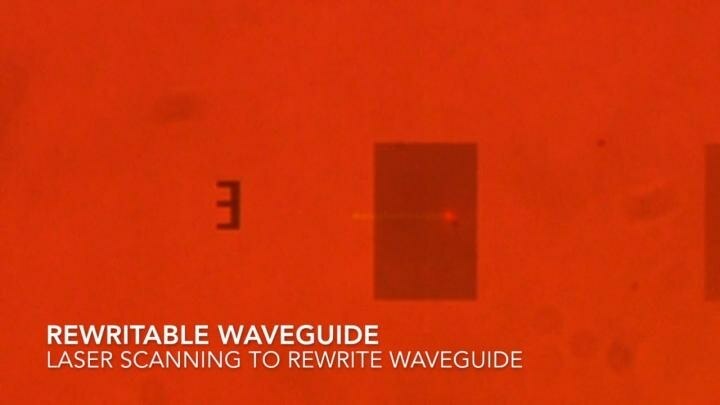 The researchers believe they are the pioneers in rewriting a waveguide by employing an all-optical technique. Their principal advancement is a specifically designed hybrid nanomaterial similar to an Etch-A-Sketch toy of a child—only the material is dependent on tiny molecules and light to draw, delete, and re-write optical components. Scientists and engineers are fascinated by rewritable components that make use of light instead of electricity to transfer data. This is because they have the ability to make devices smaller, faster, and highly energy-efficient when compared to components made of silicon. Rewritable optics, which forms the basis of optical storage devices like DVDs and CDs, is a concept of intense research. The major disadvantage of DVDs, CDs, and similar state-of-the-art rewritable optical components is that they necessitate stand-alone, bulky light sources, light detectors, and optical media. On the contrary, the UT Austin innovation enables writing, erasing, as well as rewriting of data on 2D nanomaterial, thus enabling the development of nano-scale optical chips and circuits. To develop rewritable integrated nanophotonic circuits, one has to be able to confine light within a 2-D plane, where the light can travel in the plane over a long distance and be arbitrarily controlled in terms of its propagation direction, amplitude, frequency and phase. Our material, which is a hybrid, makes it possible to develop rewritable integrated nanophotonic circuits. The primary surface of the researchers’ material is a plasmonic surface made of aluminum nanoparticles. A 280-nm polymer layer comprising molecules with the ability to respond to light is placed on top of the plasmonic surface. As a result of the quantum mechanical interactions with light, the molecules can either absorb the light, or become transparent, enabling the light waves to propagate. Another ability of the material is to operate two light-transporting modes at the same time, known as the hybrid mode. The plasmonic mode of the material can drastically amplify the light signals even within a smaller space, whereas its dielectric waveguide mode guides light propagation over a longer distance. The hybrid mode takes the advantages of both dielectric waveguide mode and plasmonic resonance mode, and combines them together while circumventing the limits of each. We realized an all-optical control through a technique, called photoswitchable Rabi splitting, which, for the first time, can be achieved in the hybrid plasmon-waveguide mode. The performance of the optical cavity in the hybrid nanomaterial is considerably enhanced as a result of the integration between the two modes, which exhibit low optical loss and high quality factor, thus maximizing the coupling between the hybrid mode and the molecules. According to Zheng, before designing a nanophotonic circuit or an optical chip using this material, various challenges—such as optimization of the molecules to enhance the stability of the re-writable waveguides and their performance for optical communications—ought to be dealt with.